"... Ending the life of a criminal as punishment for a crime is inadmissible because it attacks the dignity of the person, a dignity that is not lost even after having committed the most serious crimes." This revision of the Catechism of the Catholic Church makes it official: the Roman Catholic Church opposes any use of capital punishment and commits itself to end its use worldwide. GetReligion's Terry Mattingly points out that the anti-death penalty stance of Pope Francis, a hero to Catholic liberals, was simply following the trajectory established by his more conservative predecessors, who were already poised on the edge of an outright prohibition of capital punishment. What impact will this new pronouncement have? Back in 1999, I was part of a lobbying team in Lincoln, Nebraska, attempting to convince Catholic governor Mike Johanns (a devout believer and generally a thoroughly decent politician) to commute the death sentence of Randy Reeves. [More details of that case here (1988), here (1999), and here (2016).] Reeves came within two days of the electric chair, saved by an intervention in the Nebraska Supreme Court, not by the governor. Will today's Catholic politicians recognize that the death penalty is a violation of that same principle ("the dignity of the person") that governs Catholic opposition to abortion and euthanasia? The dignity of the person is not a decisive factor for the world's systems, but when we've had our lives turned upside down by Jesus, our ways should be very different, and the world should notice! During a period in our history when the public impact of the Christian faith doesn't seem to fall on the side of mercy very often, today's "inadmissible" headlines give me a lot of joy. 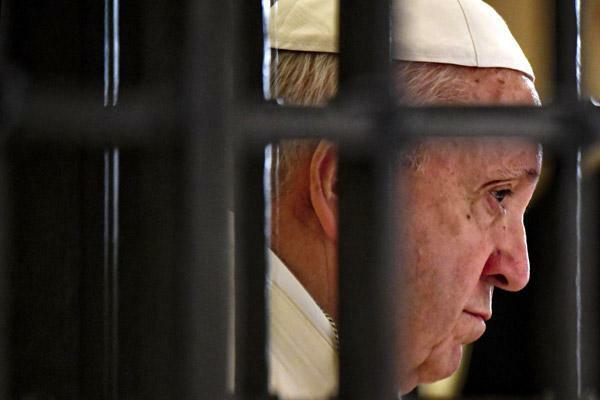 Mark Silk: Francis kills the death penalty for Roman Catholics. Harriet Sherwood covers the political implications, including Vatican-China relations. Sister Helen Prejean comments on the Vatican announcement. Friends United Meeting's statement on capital punishment (1960). My testimony to the Indiana State Senate, February 1999. On losing a sister to murder. Bobby Ross, Jr., on Michael Graczyk, a journalist who has witnessed over 400 executions. Russians: Take a line from Spike Lee and do the right thing! In the meantime, Amnesty International representatives are not allowed to visit Oleh Sentsov on day 81 of his hunger strike. Amy Young on Richard Rohr, the second half of life, and what it all means for organizations. Martin E. Marty on farm religion. Ed Stetzer on our missionary identity. Parker Palmer on six gifts of aging. Tim Berners-Lee, World Wide Web creator, feels something has to change, and is methodically attempting to hack his creation. Kim Wilson and Rick Estrin showing off!